The President of the Senate, Dr. Abubakar Bukola Saraki, on Monday launched a contest to promote Made in Nigeria products. 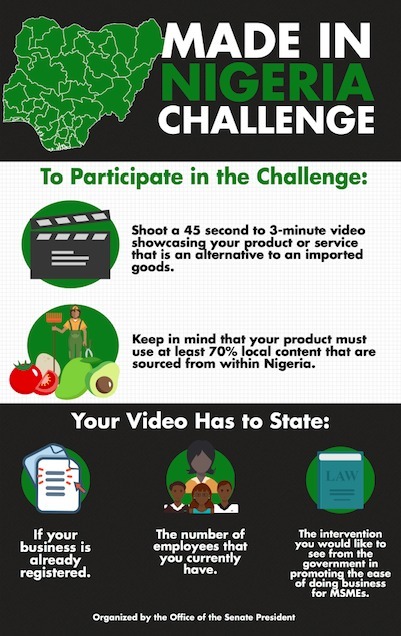 “Today, as promised, we kick-start the soft launch of the #MadeInNigeria Challenge.This campaign is organized to showcase everyday products that are used by Nigerians and produced by Nigerians locally that serve as alternative to imported products. “The next few weeks, we hope to identify products and ideas that can be matched with investors and government agencies. To wrap up the Challenge, in March, we will be inviting some of the finalist to a Made In Nigeria Roundtable at the Senate. “This roundtable will allow us - legislators, government agencies, business owners, and everyday Nigerian consumers to review and update the report of the National Assembly Business Environment Roundtable (NASSBER), which was held in 2016 to improve the ease of doing business in the country,” he said. Saraki's aide added that from feedback received from Nigerians, people want to see improved ease of doing business, access to funding, effective oversight on agencies to make sure they are actually giving preference to Made In Nigeria and most importantly to make sure clear guidelines that are accessible online are set by the Corporate Affairs Commission (CAC), Standards Organization of Nigeria (SON), National Agency for Food Drug Administration and Control (NAFDAC), Nigerian Export Promotion Council, etc.